Ekspla, the laser company, is introducing a new picosecond high power UV laser. The Atlantic UV30 industrial picosecond laser is capable of producing 30 W of output power at 355 nm. In the industrial market, increased reliability and decreased cost of ownership of high power and UV components is critical. The Atlantic UV30 harmonic module optical layout was optimized for longevity and stable operation in UV range. As a result, 8000 hours UV optics lifetime is guaranteed, which is more than 11 months 24/7 service free operation. Short, 10 ps pulse duration minimizes the heat-affected zone of processed material. Due to the high 75 µJ pulse energy and UV output, the laser can be adаpted for tough processes, like OLED cutting; sapphire processing, ceramics micromachining. Due to negligible output beam spatial characteristic change in wide output power range, the Atlantic UV30 delivers a cost saving flexibility to use the same system for employing numerous operation modes and processing of various materials. High (up to 1 MHz) repetition rate enables this laser to be used in high throughput material processing systems requiring speed and precision. To tailor laser performance for specific applications, advanced electronics enable important features like external synchronization and precise triggering with jitter of 7ns (RMS), as well as analog AOM pulse control, which helps to change energy of pulses in real time with immediate response. 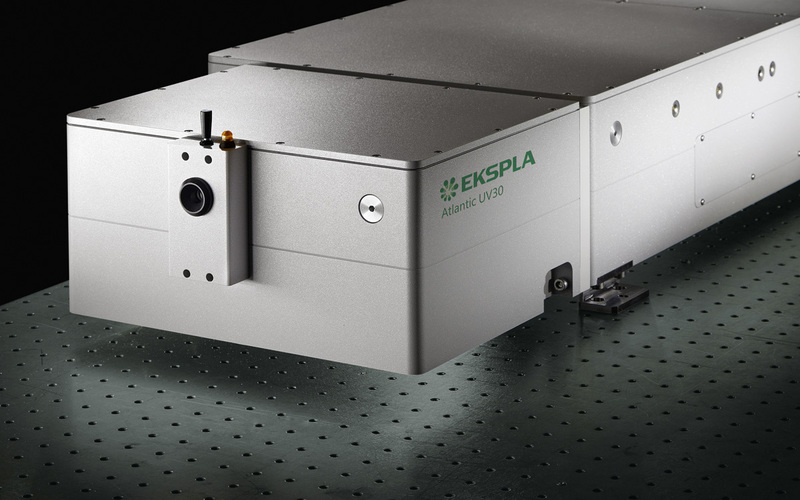 Ekspla employed all it’s 25 years of experience by building an advanced laser optical layout: long-life fiber master oscillator combination with amplification stages, placed in a sealed monolithic block, thus ensuring stability and resistance to possibly negative ambient conditions. Each Atlantic UV30 laser produced at Ekspla passes strict quality control test and inspection procedures. Every single unit is checked for vibration resistance, operationally tested at different environment temperature and humidity, as well as subjected to high temperature (up to 70 °C) thermo-cycling. Prior to shipment, Ekspla performs extensive testing to verify multiple external and internal laser parameters to ensure the lasers are meeting their technical requirements.